Living in a terribly cold place with a failing economy can certainly inspire some highly unusual creations. Russian cryptocurrency startup Comino has come up with a high-tech solution that aims to tackle both crippling recession and cold weather: An Ethereum mining device that also doubles as a heater. The inventive company says the contraption comes with a sturdy liquid cooling system and also supports various hashing algorithms, which makes it perfect for mining Ethereum and other cryptocurrencies. The extravagant mining rig boasts eight high-end ASUS P106-100 6G graphic processors tightly crammed into a slim all-metallic body. It comes in two variations, the Comino N1 and the Comino N4: The former optimized for mining Ethereum and the latter for Zcash. Co-founders Evgeny Vlasov and Alexey Chistov estimate that, at the current exchange rate of Ethereum, the device could net you about $300 a month. That number, of course, will also vary based on your local energy consumption rates. 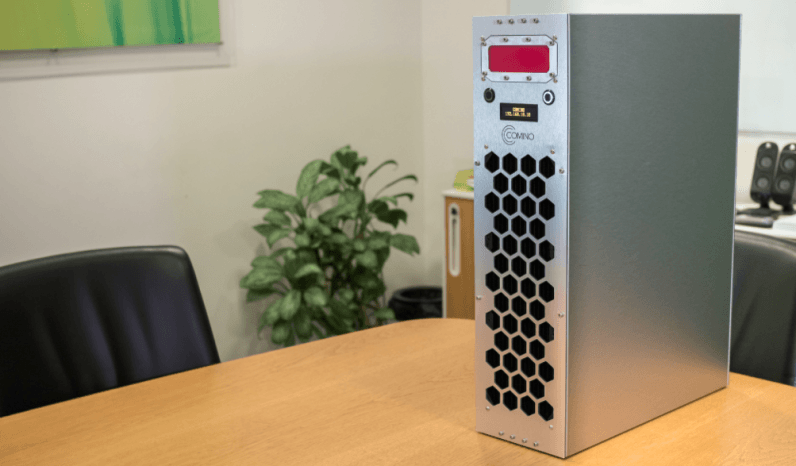 The upside to this is that, in addition to stacking crypto coins, each Comino cryptoheater packs enough oomph to keep a 25-30 square meter room comfortably warm, according to the company. Perhaps the least appealing aspect about the Comino cryptoheater is its exorbitant price. The device sells at $5,000 a pop, though you can currently cop one at a discount at $4,500. For context, building your own GPU mining rig could cost less than half. However, Comino argues that what makes its machine worth the extra buck is their promise that it will last longer (thanks to its patented liquid cooling system), make less noise, and of course, keep you warm in winter. Still though, shelling out five grand for a heater seems like a dubious investment, if you ask me. That is, unless you’ve already opted to keep your place warm using one of these heater-servers – in which case, the Comino should be right up your alley. Meanwhile, those interested in setting up their own crypto-mining rigs ought to also have a look at the numerous ways they can cut costs and protect the environment by mining with renewable energy.